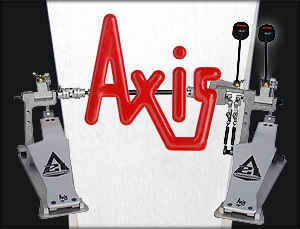 AXIS PERCUSSION takes great pride in specializing in precision foot pedals and drum hardware.Their products are fabricated from aircraft grade aluminum and steel, each part being machined in the factory in Carson, California, U.S.A.
All A and X series double pedals have a left-handed version as well. What makes the left version different from the right is the axles on the slave pedal and the auxiliary beater are threaded in reverse of the right-hand pedal and the bridge is entirely different (much larger on the left version). The auxiliary beater arm is reversed on the left version.